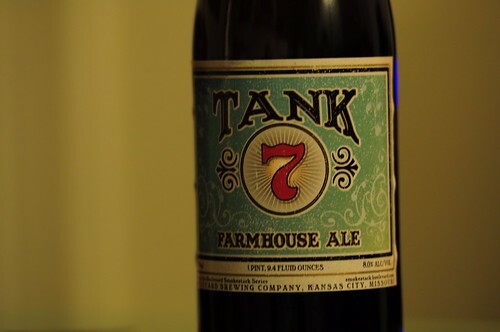 Boulevard Tank 7 Farmhouse Ale, originally uploaded by adambarhan. Appearance: Pours a cloudy, light honey-colored body with a tall, dense, airy, white head that’s long-lasting due to high carb. Smell: Spicy, citrusy nose with finely-ground white pepper. Farmhouse smells. Taste:. Light honey taste in the front. Peppery spiciness throughout. Hints of apricot. Crisp, nicely drying finish. Drinkability: Tasty, refreshing, well-balanced, easily drinkable after a long hot ride in Texas. Pairs well with our Pizza.